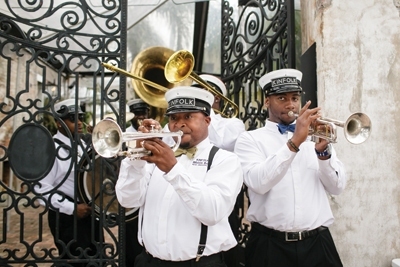 Brides getting hitched in New Orleans — a city known for its music — will want to devote some extra time into planning the perfect soundtrack. This doesn’t have to be high-pressure and is probably one of the most fun parts of wedding planning. Music is universally appreciated and there are so many ways to customize your ceremony, reception and after party. If you’re a music lover, consider incorporating that passion into your wedding venue itself. New Orleans has no shortage of music halls, whether you’re looking for a classic French Quarter spot such as Preservation Hall — with its small front room and intimate outdoor patio — or going with a bigger, more upscale location, such as the sleek Civic Theater. House of Blues also hosts special events and can accommodate both the ceremony and reception. DJ Jacob Towe, whose company handles ceremonies, receptions and after parties, says he has noticed a lot of brides are turning to more contemporary music when it comes to walking down the aisle. “I haven’t played the Wedding March [note: commonly known as ‘Here Comes the Bride’] at a wedding in about seven years,” he says. “No one plays that. The original organs — no one does that anymore. I really encourage brides to make it fit with their personality.” Some brides choose popular songs and have them “remixed” — for example, using a string instrument version of a Beatles song to walk down the aisle. In the past couple of years, and especially this year, people have been wanting to book multiple acts and change up the genres to suit the mood. The exchange of vows is likely going to be the most serious part of the evening; after that, the mood is light and people are feeling more relaxed and celebratory — the music should reflect that. For a cocktail hour and reception, think about booking a jazz singer that’ll be romantic but festive. After dinner and drinks, when guests are cutting loose on the dance floor, consider hiring another band, maybe a funk or rock band, or a DJ who can spin a variety of songs that’ll keep people on their toes. DJ Jacob Towe says he seamlessly blends the aesthetics and décor in with the music and mood. He is able to project a digital environment that completely changes the look of the room from a screen. “People are blown away by it,” he says. He takes measurements of the room and creates graphics to project onto the walls. “We cut out where the windows and doors are on the computer, and we essentially paint the walls with graphics. During cocktail hour, we can show bubbles going up the wall. Once we did a wedding with a Parisian theme, so we projected images of the Eiffel tower. It’s a huge décor statement that you don’t have to construct, build or install; it’s much faster to project it.” He also uses CO2 cannons that enhance the special effects. “Usually we have the bride come up between the booth and start off the after party by shooting the cannon into the crowd.” This is the same kind of cannon that is used at major music festivals and high-end clubs.